Allows users to print selected items from list or library with all metadata fields. Allows printing of 100 items in one go. Displays the number of items selected before printing. 4. Click “Print” to print the selected items. A pop-up will appear, click “Print” from the print pop-up. the “Library“. This is shown in the screenshot below. Note: If the user doesn’t select any of the item(s) in the list or library and clicks “Selected Items Print” icon, the message below will appear. Q:1. What is "Selected Item Print" add-in? 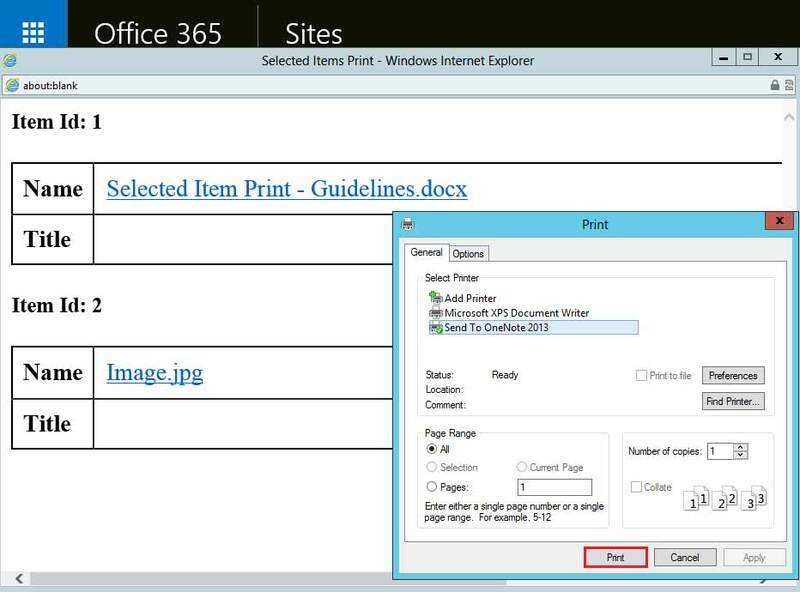 The Selected Item Print is a SharePoint add-in that works with SharePoint 2013 and SharePoint Online (Office 365). You can install it from the Sharepoint add-in store. 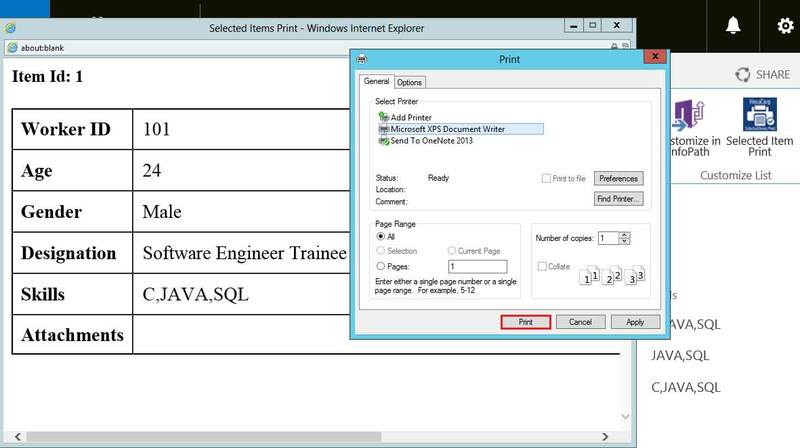 It allows users to print the selected item(s) in Sharepoint list or library. Q:2. Does the "Selected Item Print" add-in support all kind of lists and libraries? Q:3. Does the "Selected Item Print" add-in prints only the view level fields? No, it does not support the view level fields to print. Q:4. Does the "Selected Item Print" add-in support Managed Metadata and External data columns? Contribute permission is required to use this add-in. If you have Contribute permission for a corresponding list or library, you can proceed by clicking the “Selected Items Print” in the “LIST” tab for the list and the “LIBRARY” tab for a library in the respective SharePoint ribbon. Step: 3. In this tab, click on the “Trusted Sites” option. This will enable the “Sites” button. Step: 4. Select your site from the “Websites” category box. Step: 6. Click the “Close” button to close the window and then the “OK” button to complete the process.